Singapore, 15 October 2018 — NETS today announced the launch of PayCollect, a new service that allows businesses to issue invoices and collect payments electronically, speeding up collections and improving on their cash flow management. For the consumer, paying bills or invoices will become even more convenient and accessible through their mobile phones, anywhere, anytime. With PayCollect, billing organisations can send e-invoices to their customers as a request-to-pay notification via SMS/email, for payment using DBS, OCBC, UOB or NETSPay mobile apps. After receiving the e-invoice, consumers can choose to pay by clicking on a link within the notification and be directed to a secure payment page for confirmation. PayCollect is also integrated with popular accounting packages for corporates and SMEs to go fully electronic for the entire billing, payment and reconciliation cycle. They can hence easily and seamlessly issue e-invoices, track payment status real-time and perform end-of-day reconciliation all within their accounting process. Leading accounting software MYOB offered by ABSS through a partnership with Mint Payments will be supported for a start, with other software packages following soon after. Smaller merchants such as delivery and personal services (for example, tuition providers, florists, drycleaners, handymen) without accounting packages will also find PayCollect useful as they only require a customer’s mobile number in order to bill them. An e-invoice can be sent to their customers for e-payments on-the-spot. Charitable organisations can also improve their processes and lower the operating cost of collecting donations with this service. KK Women’s and Children’s Hospital selectively implemented the PayCollect service with NETS in March this year for their wellness programmes and events to encourage more cashless payments. Response has been positive with more participants using PayCollect to pay their fees. The hospital is exploring extending the service. 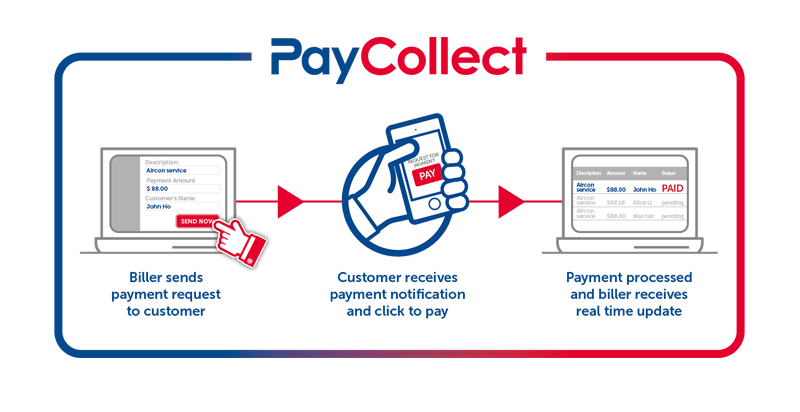 PayCollect complements national e-invoicing and digitisation initiatives, including the nationwide B2B e-invoicing framework recently launched by IMDA, as it provides businesses with the capability to extend e-invoicing to consumers and reduces cash and cheque usage. Merchants who are interested in signing up for the service may visit https://www.nets.com.sg/business/ecommerce-solutions/paycollect/.